Elk Falls is located north of the city of Campbell River and gets its name from the 25 metre waterfall, where the Campbell River plunges over a rock precipice into a rock walled canyon. 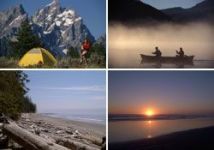 Other attractions include magnificent forest trails, a nearby salmon hatchery and in autumn, salmon spawning in the Quinsam and Campbell Rivers. The campsites grace the shoreline area of the Quinsam River. The quiet riverside campsites are located in the heart of a world renowned fishing area. During late spring and through the summer, you can head to the tidal waters to fish the legendary chinook and feisty coho. Rainbow, cutthroat and Dolly Varden trout have been stocked in surrounding lake areas as spring progresses. From November to March, the steelhead run in Quinsam River. Elk Falls provides a convenient base camp for day tripping such as destinations to Gold River, Kelsey Bay, Rock Bay, Sayward Forest area and Quadra and Cortes Island parks.